I'm continuing my hole in the wall week with a trip down cookie lane. Dogpatch is an up and coming neighborhood (though they've been saying that for years now) and it does have some out of the way spots to get a quick bite to eat. One such place is tucked away in the back of one of the American Industrial Buildings on 3rd Street and it can be difficult to find if you haven't been there before. Called Jolt N Bolt Cafe, it is strictly a Monday through Friday lunch spot for those who work in the hood. They make a handful of salads and sandwiches for the tech crowd offices in the building but they also make their own baked goods on premises and this, of course, is what drew me in. Particularly the large chocolate chip cookie you see above. I'm a sucker for big chocolate chip and this one did not disappoint. It's as big as my hand and loaded with tiny little chocolate bits pretty much throughout every bite. The edges are crisp leading to a soft center. The middle is also thick, but unlike other cookies, it is cooked properly and neither too doughy or or too dry. 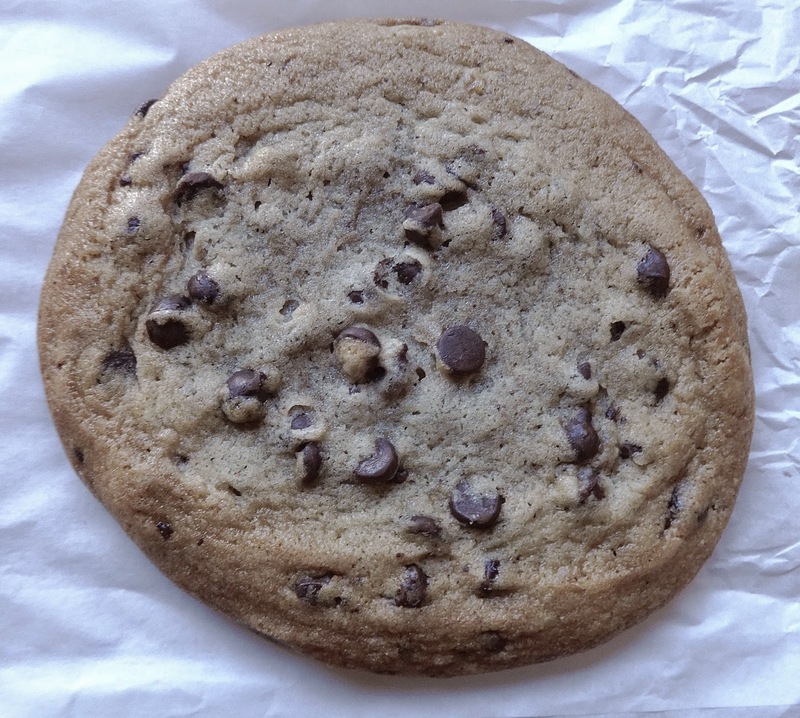 For me, it is one of the better large size cookies in this town. At $2.25 a pop, the price and what you get match up nicely to make it worth it. The only thing that could make it better is to be served warm, but that's not always possible, plus a few seconds in the microwave can take care of that easily. The do offer a smaller size version of this for $1 and it also good, but hey, why bother. If I'm gonna cookie it up I'm going all the way for the big one and enjoy every bite will chowing down on it. That Basque restaurant in the Swedish American Hall has finally opened. Try it now before it becomes too trendy to get in to. The new trend of food trucks going brick and mortar has struck upon Del Popolo Pizza truck. Look for them in Potrero Hill soon. SFist says we will never get another In-And-Out Burger. Because there aren't enough burger joints in town already? Or they just don't like going down to Pier 39. Ice cream and beer!! Wait, hasn't this been done before? Here's 7x7's Big Eat list for 2015. That''s 100 things to try in the Bay Area. Epic Roasthouse and Waterbar changed owner hands. Wonder what other changes are in store. Top Chef will be swinging back through San Francisco for its new season. The first time since the shows first season. Sprig, that on demand food delivery service I reviewed recently, just got a $45 million infusion to expand. Here they come New York and Chicago. Umami Mart--celebrating America's first Japanese beer shop!! Dandelion Chocolates on Valencia is building a parklet. And wants a fire pit to roast marshmallows. Because the Mission needs another place to burn something? The new season of Check, Please! Bay Area has started again so break out the wine--it's Leslie Sbrocco time!